Just few days after the Blackberry KeyOne was officially announced, another leak of a new blackberry phone tagged as BBC100-1. This is just a pointer that Blackberry is really working hard to regain and capture the market again. Earlier rumor suggest that BBC100-1 will be running a Snapdragon 425 clocked at 1.4 GHz and sporting a large, 5.5-inch screen at 720p HD, 4GB of RAM and 32GB of internal storage. Well, this device is said to have Dual-SIM support and packs a 3,000 mAh battery. 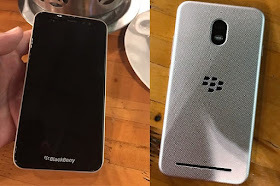 Dual-SIM support would certainly be a first for a new age BlackBerry-branded smartphone and will be built by PT BB Merah Putih for the Indonesia market. We expect to see more Blackberry devices being unveil this year 2017. What do you think?